James de Sottone, le Fitz. Joan de Okinton. Adam de Cretingges. 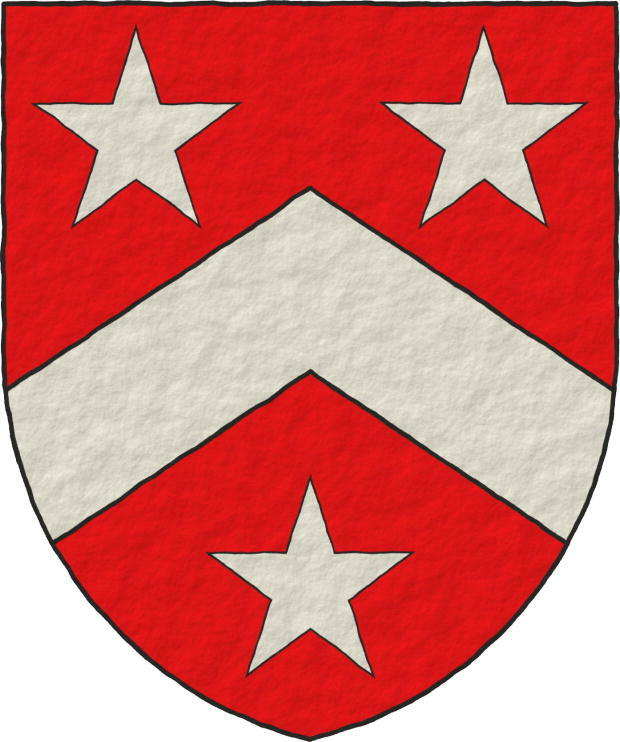 Howel ap Res. Nicholas Malmains. 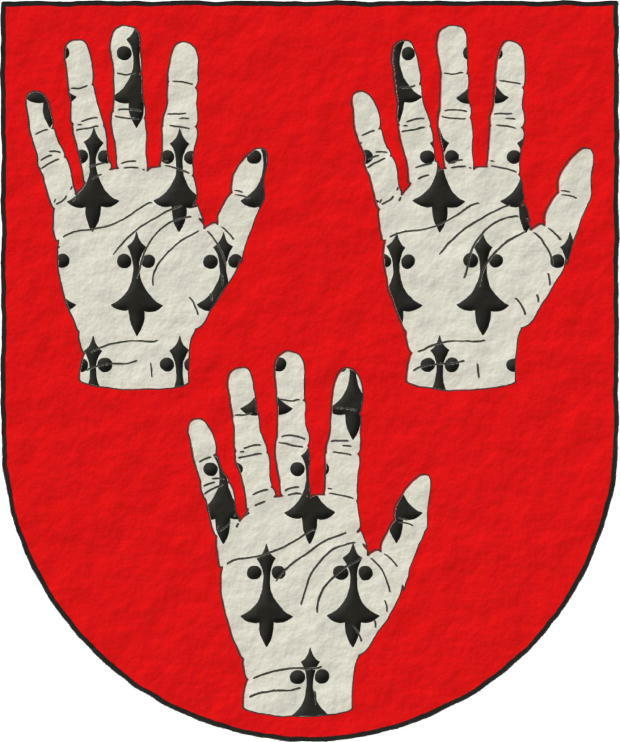 Sable, three Dexter hands Argent, turned up, and appaumée. 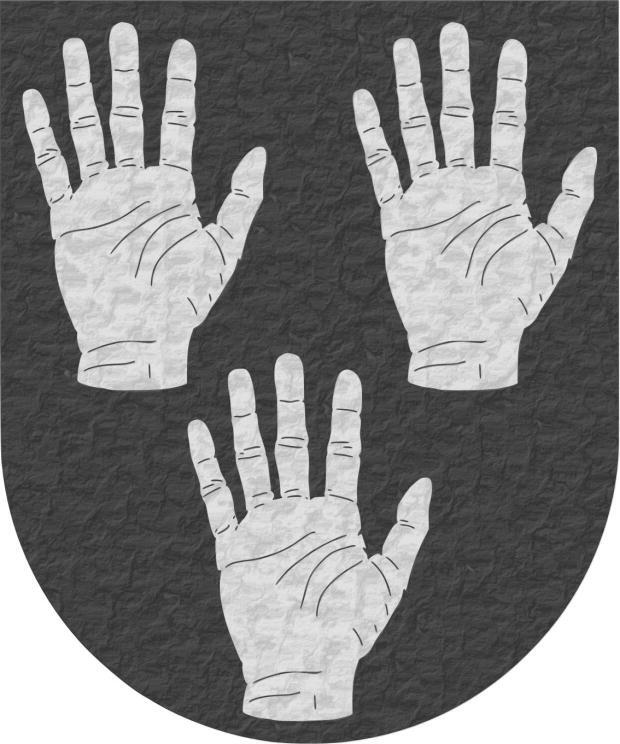 Escudo de sable, tres manos diestras de plata, levantadas y apalpadas. 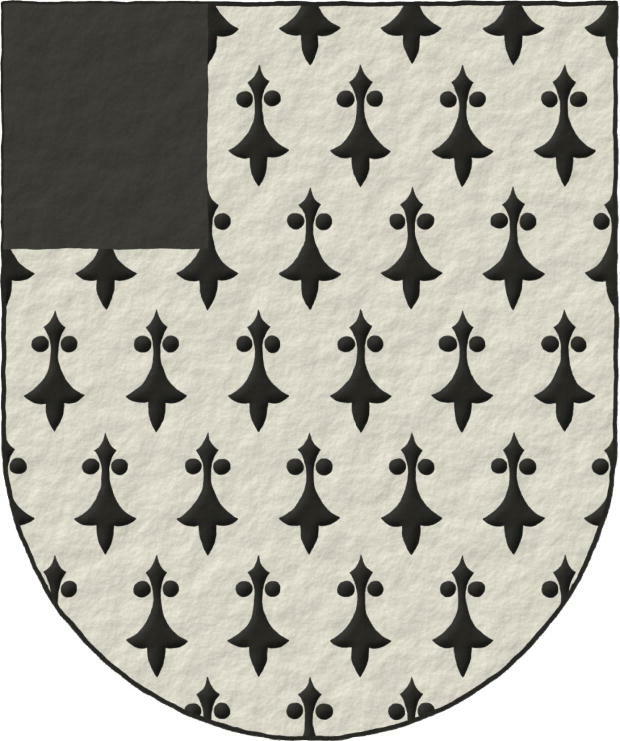 Coat of arms interpreted based on blazon and explanations of [Avilés, J.; 1725a; pages 34 y 35 y sheet 2 figure 38]. 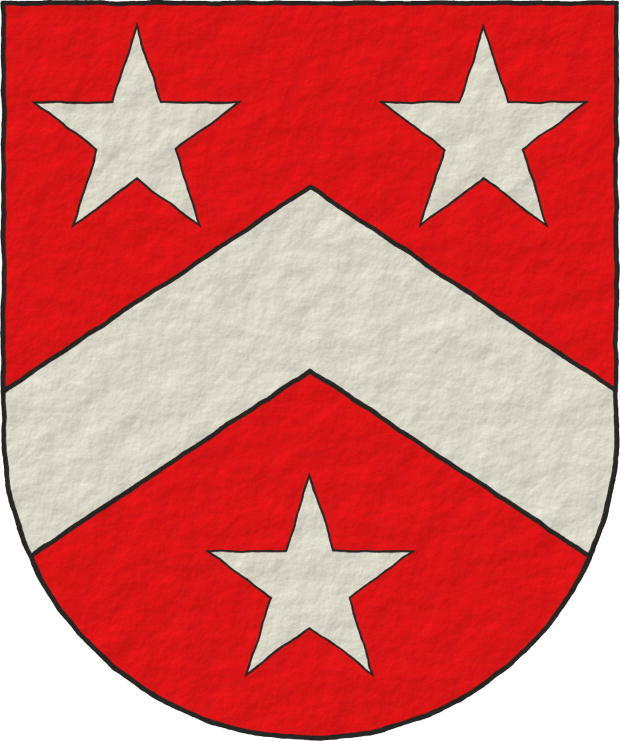 Blazon keywords: Without divisions, Sable, Three, Hand, Dexter, Argent, Turned up, Appaumée and Ordered. Style keywords: Semi-circular, Spot ink, Outlined in the field tincture and Soft metal. Classification: Interpreted, Personal and Kingdom of France. Sigue por: John de Ladbrooke. 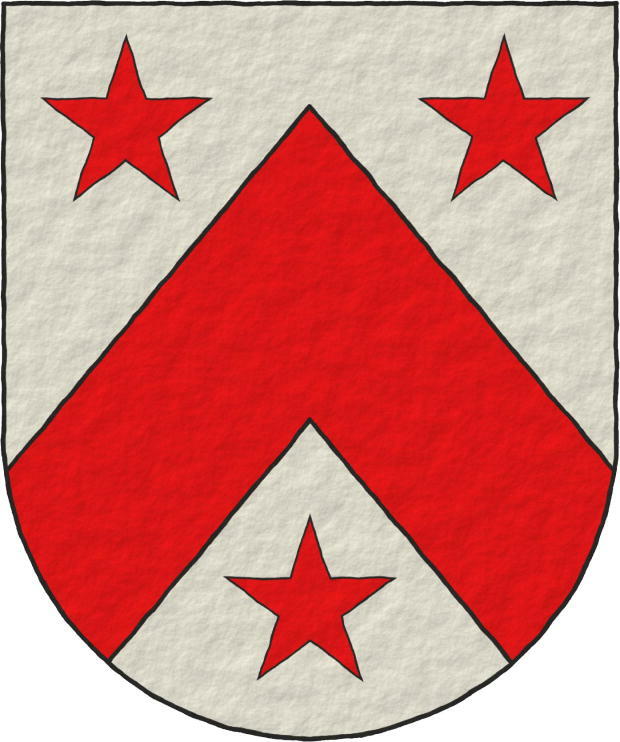 Between, Adan de Creeting, Appaumée, Pointed, Ermine, Azure, Baudry en Francia, Chevron, Canton, Outlined in sable, Outlined in the field tincture, Dexter, Mullet, Personal, Gules, Howel Ap Rhys, Illuminated, Interpreted, Jaime de Sutton, Juan de Ladbrooke, Juan de Octon, Juan le Sturmy, Turned up, Hand, Semi-circular, Soft metal, Nicolás Malmains, Ordered, Or, Argent, Without divisions, Cinquefoil, Kingdom of France, Sable, Spot ink, Freehand, Three, Triangular curved and One.